The Red Sox rallied from a 3-0 deficit to beat the Twins 6-3 at Fenway Park on Thursday night. David Price went seven innings for the win, allowing all three Minnesota runs on six hits. He struck out seven and didn't walk a batter. 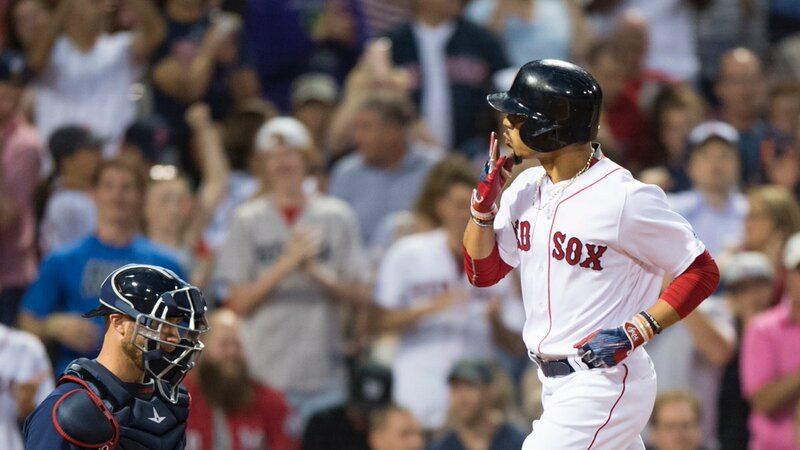 Mookie Betts (pictured) drove in the first Boston run in the bottom of the fourth inning with a solo home run, his thirteenth of the season. The Sox added three more in the fifth on an RBI double by Jackie Bradley Jr., a run-scoring ground out by Deven Marrero, and a Betts single that drove in another. Hanley Ramirez hit a solo home run in the sixth and Marrero doubled home Tzu-Wei Lin in the seventh. Joe Kelly tossed a clean eighth inning and Craig Kimbrel closed things out in the ninth with his save of the year. JBJ led Boston with three hits to improve his average to .272. Betts and Lin each had two hits.